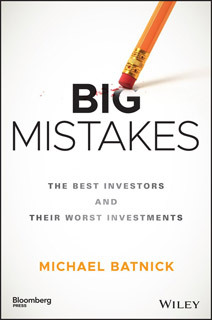 A Must-Read for Any Investor Looking to Maximize Their Chances of Success Big Mistakes: The Best Investors and Their Worst Investments explores the ways in which the biggest names have failed, and reveals the lessons learned that shaped more successful strategies going forward. Investing can be a rollercoaster of highs and lows, and the investors detailed here show just how low it can go; stories from Warren Buffet, Bill Ackman, Chris Sacca, Jack Bogle, Mark Twain, John Maynard Keynes, and many more illustrate the simple but overlooked concept that investing is really hard, whether you're managing a few thousand dollars or a few billion, failures and losses are part of the game. Much more than just anecdotal diversion, these stories set the basis for the book's critical focus: learning from mistakes. These investors all recovered from their missteps, and moved forward armed with a wealth of knowledge than can only come from experience. Lessons learned through failure carry a weight that no textbook can convey, and in the case of these legendary investors, informed a set of skills and strategy that propelled them to the top. Research-heavy and grounded in realism, this book is a must-read for any investor looking to maximize their chances of success. *Learn the most common ways even successful investors fail *Learn from the mistakes of the greats to avoid losing ground *Anticipate challenges and obstacles, and develop an advance plan *Exercise caution when warranted, and only take the smart risks While learning from your mistakes is always a valuable experience, learning from the mistakes of others gives you the benefit of wisdom without the consequences of experience. Big Mistakes: The Best Investors and Their Worst Investments provides an incomparable, invaluable resource for investors of all stripes.